Is Frank Is Dropping Music With SZA, Kendrick Lamar, André 3000? But from Frank, we'll take anything. So, the decoding. Solana = SZA. The R&B princess's real name Solána Imani Rowe, plust most of us expected a full collab from the pair after Frank teased a cover of CTRL hit "The Weekend." "Andre" is André 3000, another match-up that makes sense given that Frank's "Solo (Reprise)" featured a verse from the iconic rapper. Finally, who is KL? Karl Lagerfeld? Kellan Lutz? Kenny Loggins? k.d. lang? (Okay would be here for that collab, but no). The likeliest and best case scenario is that KL = Kendrick Lamar, given that his and Frank's overlapping musical worlds and history as collaborators. FO and KL go way back. They worked together in 2012, when they were both featured on Mann's song "Bend Ya Neck." They also share spots on N.E.R.D. 's song "Don't Don't Do It!" Finally, "here for the beans?" I googled the phrase just to make sure it isn't a Popular Internet Meme that I'm not familiar with, but no such luck. Are the trio going into business together and opening a food truck? Or just an inside joke? An anagram? Oh wait, and then "? (2019) ? (2019) ? (2020)," though? 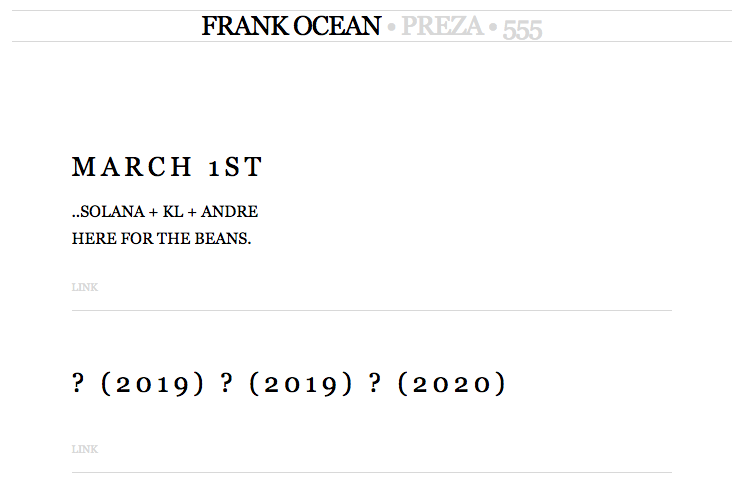 Frank provided what seems like a drop date (March 1), so what does this code mean? Could there be three tracks in the works, of which we'll get on every six months till 2020? (Please, please). We've been sustained since 2016's Blonde by singles and covers (last year, Frank shared "Moon River," a cover from Breakfast at Tiffany's and singles like "Provider" and "Biking"). But we are growing impatient and this Obama-approved dream team line-up (if correctly decoded) is so tempting that this is almost cruel. At least he was clear about one thing: whatever it is, we'll see something on March 1st. Stay tuned.